I'm Kirsten, a 14 year old high school and competitive cheerleader. About 4 weeks ago, I tore my ACL at cheerleading practice while landing my full. As my left foot hit the ground, my body had not completed the twist. I felt a terrible popping in my left knee and parents heard the pop over music all the way accross the gym. I went to the ER that night and had X-rays done. There was no obvious injury on the X-ray and the ER doctor could not find any instability in the knee and thought it was an MCL sprain. He advised me to follow up with my family physician. I rested for about two weeks and tried to tumble again. After completing a ROBHS pass, I felt another pop as I rebounded and had to stop. I went to my family physician who ordered an MRI. It showed a complete tear of the ACL, some meniscus damage, and a strain of the MCL. After an appointment with an orthopedic surgeon, surgery was scheduled for the next week. I am now one day post surgery. I chose the hamstring graft. Last night and this morning was very painful but the pain eased this afternoon just in time for me to start physical therapy. 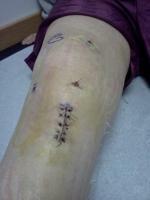 At physical therapy, the brace and bandages were removed and I got to see my scar. I have two small incisions, one round incision (belly button) and one slightly larger incision. My leg looks much better than I anticipated. The therapist made me bend my knee (very scary) but I am glad I did it. I now have three new exercises and am learning to walk on my crutches and go up and down stairs. I have enjoyed reading many inspirational stories from others who have suffered ACL tears and hope that my story helps inspire others as well. Although it is very early in my recovery, I am confident that I will return better than ever! My goal is to return for varsity tryouts in April and help my competitive team compete at US Finals and Worlds in late April/early May.